What is S.G (Spheroidal Graphite) Iron? Developed in 1943, it was found that by adding magnesium before pouring caused the graphite to form nodules rather than flakes. This resulted in a new material, with excellent tensile strength and ductility. Adding these mechanical properties of this material to the advantages already offered by cast iron soon led to it finding its way into virtually every mainstream area of engineering. In many cases replacing existing steel castings or forgings due to achievable cost savings. Tensile strengths of up to 900N/mm2 (ADI gives the option of higher strengths). When compared to other ferrous metals. Free graphite in the structure also lends itself to machining (chip formation). Significantly cheaper than most materials. 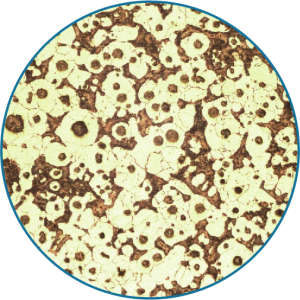 The composition of S.G Iron varies little to that of Grey Iron, yet this material offers ductility and increased strength.The reason lies as one of its many names suggests in its microstructure (Nodular Iron), which refers to the formation of graphite spheres (nodules) rather than flakes. The flakes whilst giving grey iron its unique properties are detrimental to its mechanical strength, breaking up the continuity of the metallic matrix preventing ductility. On top of this the sharp edges of the flakes act as stress raisers further reducing strength.S.G Iron does not have this problem as the graphite is in discrete spheres, giving continuity of the matrix therefore allowing ductility. As the graphite has no sharp edges there are no stress raisers that would otherwise reduce the strength of the metal matrix.